Analysing the transformation of Berlin’s former Allied border control point, "Checkpoint Charlie," into a global heritage industry, this volume provides an introduction to, and a theoretically informed structuring of, the interdisciplinary international heritage debate. This crucial case study demonstrates that an unregulated global heritage industry has developed in Berlin which capitalizes on the internationally very attractive – but locally still very painful – heritage of the Berlin Wall. Frank explores the conflicts that occur when private, commercial interests in interpreting and selling history to an international audience clash with traditional, institutionalized public forms of local and national heritage-making and commemorative practices, and with the victims’ perspectives. 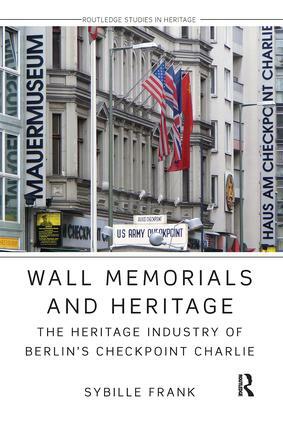 Wall Memorials and Heritage illustrates existing approaches to heritage research and develops them in dialogue with Berlin’s traditions of conveying history, and the specific configuration of the heritage industry at "Checkpoint Charlie". Productively integrating theory with empirical evidence, this innovative book enriches the international literature on heritage and its economic and political contexts. Sybille Frank is Professor in the School of Planning, Department of Sociology at the Technische Universität Berlin, Germany.